Why Ayyappa Devotees Wear Black Dress to Sabarimala Ayyappa Temple? 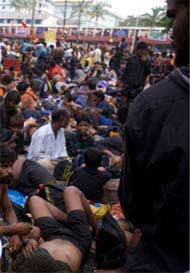 Majority of the pilgrims visiting the Sabarimala Ayyappa temple wear black dress – black dhoti, trousers, shirt or T-shirt. Others opt for the saffron colored dress. The dress code is also part of the strict and rigorous preparations that a devotee undergoes before climbing the 18-steps to the Sabarimala Ayyappa shrine. The usual custom is to observe strict austerities and self control for forty-one days preceding the visit to the temple. But nowadays most pilgrims do not follow all the rules associated with Sabarimala Vratham. During the Sabarimala Vratham, the mind is made to withdraw from the worldly objects and is slowly directed towards Ayyappa. The aim is to reach Tat Tvam Asi – That Thou Art – everything is that Supreme Being. The black clothes symbolically indicate a mind withdrawn from all materialist objects. The black cloth suggests the Ayyappa devotee is dead to the world of perceptions, emotions and thoughts and he is immersed in thought of Ayyappa.